As a micro-blogging platform, Twitter has rapidly grown to widespread popularity due mainly to its unique features that set it apart from other social networking websites. One of the foundational principles of Twitter and also a key element in its success is brevity. Tweets are limited to 140 characters which is a short portion of text yet a very powerful way to communicate. In a digitally focused world where distractions and short attention span are common currencies, people tend to connect more with short and succinct content, something which Twitter excels at providing. Your profile is the front facade people check to learn who you are. Spend sometime working on your profile and write a short descriptive bio to professionally introduce yourself to your community. Include a photo of yours and a link of your digital presence elsewhere (blog, website, wiki, about.me page …etc). Your professional learning community do not need to know what movie you watched last night or what you had for super today.A good suggestion is to create a second Twitter account for family members and close friends with whom you can share your personal trivialities. Keep your professional account professional and tweet relevant and insightful tweets that can add value to your learning community. Before you click that 'follow' button, make sure you go through some of the tweets of the persons you want to follow. Quickly scan what they have been tweeting for the last week or month and see if that relates to your intellectual interests or not. Needless to mention reading their bio and checking their digital productions if they have any. Hashtags are Twitter's learning locomotive. Their purpose is to aggregate communities around content. 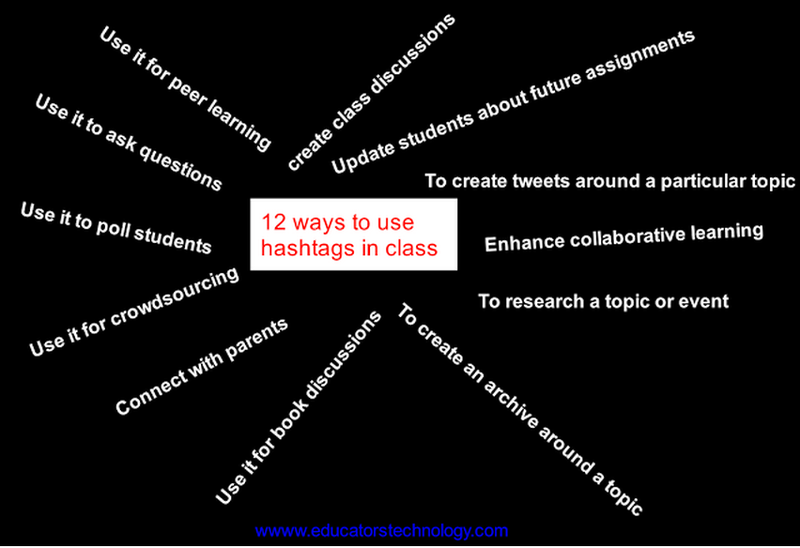 Besides providing helpful resources around a given topic, Hashtags are also good for initiating conversations and discussions with others. There are now several chat-based hashtags for teachers and educators which you can join to take part in the discussion. You can also use hashtags to keep updated about proceedings of conferences, learning events, PD sessions, and many more. Here is a very good guide to help you better understand the concept of hashtaging. Due to its textual limitation (tweets can't be longer than 140 characters), Tweeters have developed a conventional set of linguistic terms and signs to effectively and interactively communicate with each other. Understanding this language is key to an informed and educative tweeting experience. This visual guide will introduce you to the most popular Twitter lingo . Now that you have learned about the different abbreviations used on Twitter, it's time you learn about the different components making a given tweet. This visual anatomy of a tweet created by Sandy Kendell does a good job illustrating what the various elements making the body of a tweet. If you are using or planning to use Twitter in your instruction, I would recommend that you check this handy rubric created by university of Wisconsins. 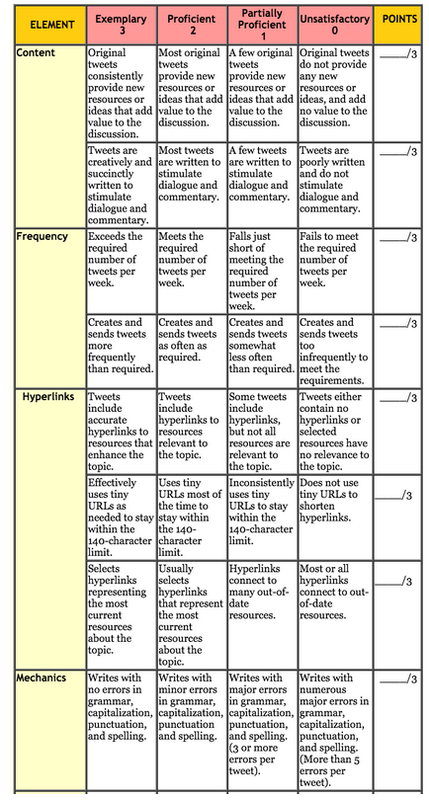 This rubric is designed specifically to help teachers assess students' Twitter use in instructional assignments. 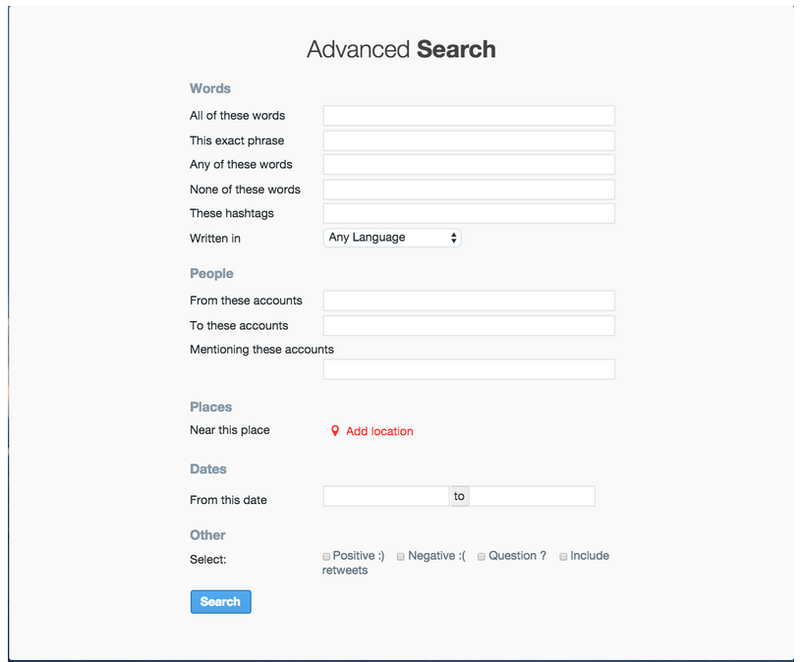 Twitter search can be a very good alternative to the conventional search engines like Google, Bing, and Yahoo. The strength of Twitter search lies in the fact it provides timely relevant and already-curated content. There are three effective ways to use Twitter to look for educational content which this post illustrates more fully.